You and your hideous troll-friends have decided that it’s time for a career change. You are tired of guarding bridges and shaking down weary travelers all for the sake of a few clinking coins! Tolls are down, bandits are up, and besides, living under your bridge is damp and uncomfortable— and breathing all that crumbling bridge mortar is taking a toll on your lungs…. It’s time to venture forth and find some fresh sea air! In TROLLHALLA, you join forces with your fellow trolls to sail the seas in search of islands filled with pillage and plunder. Crunchy livestock, nervous monks, panicked princesses, piles of gold, and casks of grog await you! But watch out for Billy Goats—if you’re not careful they will knock parts of your precious stolen cargo out of your boat! With so many goodies lying about on these islands, it feels like you’ve died and gone to troll heaven, or perhaps someplace even better—TROLLHALLA! 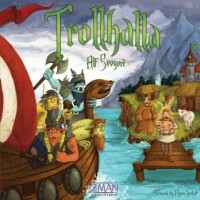 Add a Review for "Trollhalla"